As many of you can tell from looking at Jaymun's photos, he's definitely growing from week to week. It really is true that babies grow up fast and I'm thankful I've taken plenty of photos to document his developments. 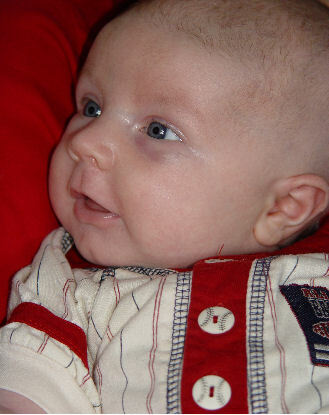 I'm sure most of you have noticed that little Jaymun started out with a fairly good crop of hair on his head when he was first born and now at ten weeks old, that hair is pretty much no more. It's a sad side effect of his chemotherapy and a pretty noticeable one at that. I know many people are thinking, "Hey, that kid doesn't know the difference. He's just a baby." I agree-except for the fact that our baby was clearly meant to have hair. When I was pregnant, I remember discussing with our other children what Jaymun might look like. We all thought he'd probably have some amount of hair on his head since none of them had been bald as babies. And we were right-he came into the world looking like he had a pretty good head start (no pun intended) on the whole hair thing. When we were told he had leukemia, the first images that popped into my mind were the children I'd seen in photos of cancer patients or advertisments promoting research funding on television, terminally ill kids with bald heads--and I realized my baby was soon going to join their ranks. And so he has. As I walk around this cancer unit, I can't help but notice the children who are sporting hairless heads-they're everywhere. I think the saddest sight is the sweet little girls wearing their pretty princess nightgowns. I imagine what they looked like before their battle with cancer, with curly blonde ringlets or long, flowing hair down their back. I sympathize with their mothers who probably brushed their beautiful hair everyday into bouncy ponytails or braided their hair before school, carefully tying on colorful ribbons at the ends. Our Jaymun has no idea what hair is. As long as he's got a clean diaper and a full belly, he could care less about what's on top of his head. It just occurred to me that I'm really the only one who's bothered about it-and honestly, considering everything else I'm worried about, it's not really at the top of my list either. His hair is pretty much gone and his eyebrows and eyelashes have disappeared too. In between chemo treatments, his hair started to make a small comeback-but this next round of chemo will take care of that. Hair today, gone tomorrow. I just thought I'd address the fact to let people know that not only is our little guy bald, he's downright beautiful.